A three year project, The Retail Search Presence Study, finds (not altogether surprisingly) that online retailers are winning over their traditional counterparts when it comes to visibility on the Big Three search engines. The study, conducted by Internet-Engine, entailed visiting and categorizing over 6,000 web pages found via search during the holiday shopping season. 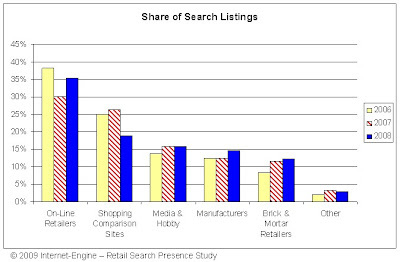 Online retailers easily dominated returned results on all the engines, with over 30 percent of the listings. Bricks-and-mortar retailer results appeared in a mere 12 percent of searches.